It's easy to add dimension to your embroidery design using 3D Puffy Foam. Predominately used on hats, 3D Foam elevates and defines the embroidered design. Layer foam to create an even more dramatic 3D effect! Standard 3D foam results in a smooth rounded-edge detail on the raised design. 3D High-Dense Foam will enhance your design with crisp edge details and appear comparatively taller. Select a foam color to closely match your thread for best visual coverage in your design. Be creative with the special effects you can achieve!! 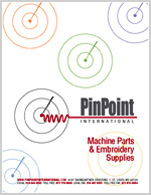 Special digitizing is required for all designs and the embroidery operator must use a stain stitch machine setting.